This model of the HUDSON RIVER has been added to a range of ships from this famous company to make a collection in the same livery. With the assistance of the Hudson Steamship Co we introduce the second of their fleet and although she looks similar to the Hudson Sound she is a considerably larger and more modern vessel. She was built by the Ailsa Shipbuilding Co, at Troon and was completed in 1949 on a gross tonnage of 3,128 tons and capable of a cruising speed of 11 knots. The Hudson River had the reputation of being the last of the large coal burning colliers on the English coast. In the late 1960's she was converted to oil burning as good quality bunkering coal was becoming hard to obtain. The noticeable lack of derricks was part of her design since coal in that period was unloaded by dockside grabs and this gave them clearance. For those who wish to modify the kit, the derricks were refitted in her later life when she went on to normal cargo traffic. 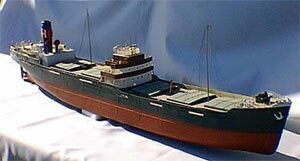 The model of this fine lined and graceful merchant ship is based on a plated and detailed fiberglass hull with all freeing ports molded in. Decks and the superstructure are in printed 1mm plastic for ease of construction. For those difficult items a sheet of vac-formings in .75mm plastic is included to construct items such as ships boats, funnel and hatch covers. When constructed the completed model captures all the grace of the prototype which is thought by many to be one of the most elegant of merchant ships. Full size plans and instruction book included also.